The International Society of Hair Restoration Surgery (ISHRS) announced an update on 6th of March, 2018 respecting the name-update of hair restoration method FUE- Follicular Unit Extraction into Follicular Unit Excision. According to ISHRS, It is a significant move for emphasizing the actual aspect of the procedure, and among patients of countries where “extraction” gives non-surgical implication. ISHRS is getting worldwide support for this update from hair transplant surgeons. How Would It Impact The Sales And Marketing Perspectives Of Hair Transplant Surgeons Of India? Now, as a digital marketing agency, we have a questionnaire for Indian hair transplant surgeons that would be related to the purpose of the update, changes in procedure, promotional changes and more. Here is the full list…! What is the purpose of this update and why now? Is the change being implemented by Indian hair transplant surgeons? Is there any governing body respecting hair restoration first approve the change? 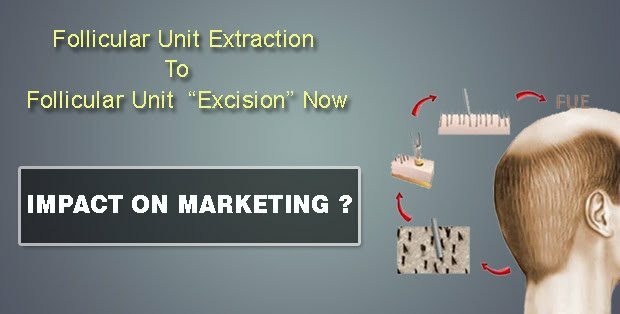 Are hair transplant surgeons updating their digital marketing and promotions such as website and social media regarding the updated word “Excision”? How would be queries of patients answered with an addition of the word “Excision”? The update has emerged as an extensive change in the view of this hair transplant technique. We request hair transplant surgeons to provide their expertise feedbacks on the post and submit necessary suggestions in reference to above mentioned blue points so that it can help all to understand real impact on the marketing of hair transplant surgeon.